When I am hosting an event, I love finding unique ways to interest or excite my friends and family members. I even strive to find creative ways to host my kids’ birthday parties too! When my son turned four, we had a party and invited some of his new preschool friends. We stuck with a colorful theme and I was looking for a fun centerpiece and things for goody bags. 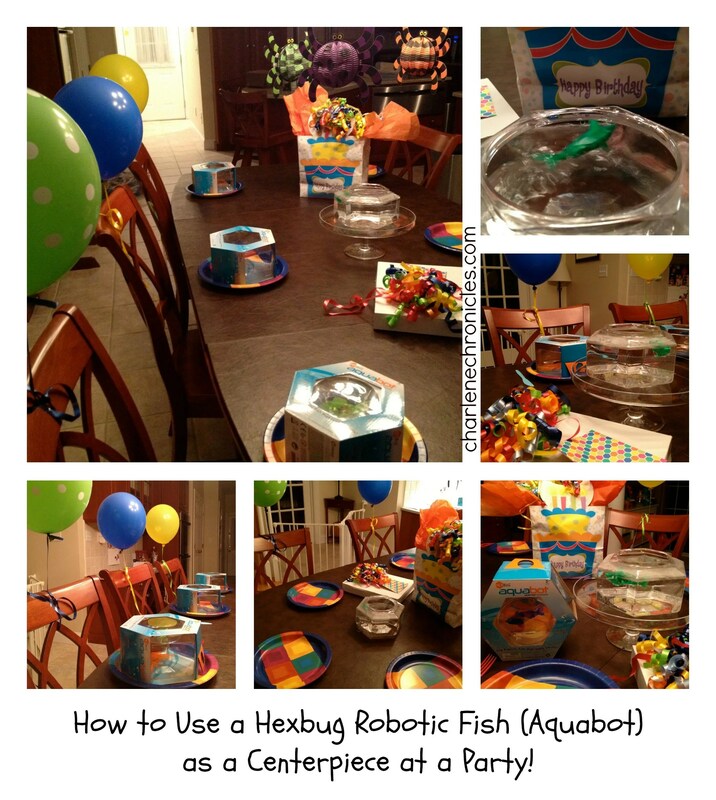 All of a sudden, I remembered seeing a Robotic Fish with bowl called the Hexbug Aquabot at The Big Toy Book’s Sweet Suite event this past July and at the time, I thought it would be a great idea, not only for a gift, but for a fun centerpiece for a kid’s birthday party. I set them up on the table and placed the others on the plates as the favors. Although you could also set them all out down the table like a runner! On the flip side, it can be a fun centerpiece for an adult dinner party. Purchase some glass bowls of unique shapes and sizes (look for great pieces at HomeGoods!) and place in the center of the dinner table. Place one Hexbug Robotic Fish in each bowl. It serves as a fun centerpiece and conversation starter as your guests sit down for dinner! For a fun adult party favor, before your guests leave, scoop out the Aquabots, place each in a ziploc bag with some water for them to take home! The next day, my son really got into playing with his new friend that he named “Balloon”. As he attempted to hold it on several occasions, it did remind me that it is probably a good ‘trainer’ pet if you are thinking about getting your preschooler a pet fish, because, well, a real one probably would not have faired well. It is also a fun gift for an executive to have on his or her desk at work, or for a college student. 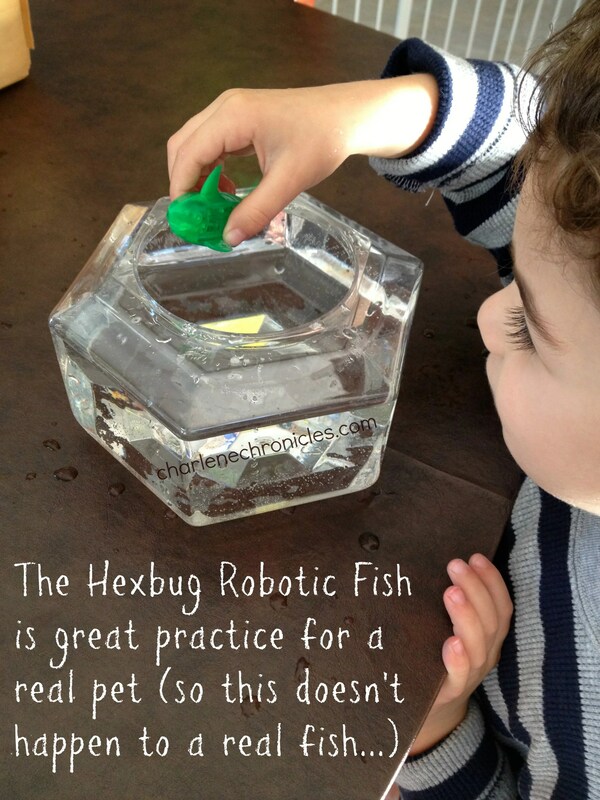 So the Hexbug Robotic Fish can be a fun gift, fun kid party favor or table centerpiece. For about $35.99 or ($15.99 for without the bowl), the Aquabot Robotic Fish is something definitely to put on your party shopping list!